First of all, are some YAM updates for Kansas Visual Arts teachers. If you happen to be a high school teacher, the Harry Hart Memorial Senior Scholarship entries are due to Lynn Felts (lynnfelts@cox.net) by January 31st. Our YAM rep, Shawny Montgomery, has put together a handy little booklet with instructions, ideas, samples, and forms. Last week I started taking my 2nd graduate course working toward my Master's in Art Education. 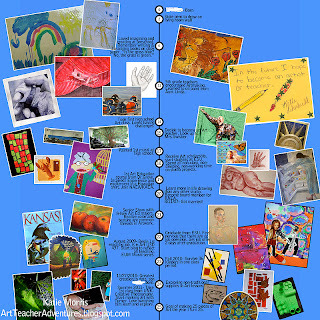 The class is History, Theories, and Philosophy of Art Education and our first assignment is an introductory personal timeline kind of thing. I thought since I spent so much time on it I would go ahead and share it here! It was hard to decide what to put on it. If you've been reading for a while, you know I tend to ramble on a bit. My husband says it's because I don't know how to edit. I say it's because all the details are important to me! The photos with white outlines are mine, black outlines are student's work. This is very attractive blog. I just like it.